A number of studies present cross sections that include geophysical logs (gamma ray, spontaneous potential, resistivity) that can be used to derive a semiquantitative estimate percent shale within the lower Potomac aquifer (Hansen, 1968; Brown and others, 1972; Cushing and others, 1973; Trapp and others, 1984). Anderson (1948) and Benson and others (1985) provided grain-size analysis results from cores that can also be used to evaluate percent shale within the lower Potomac aquifer. 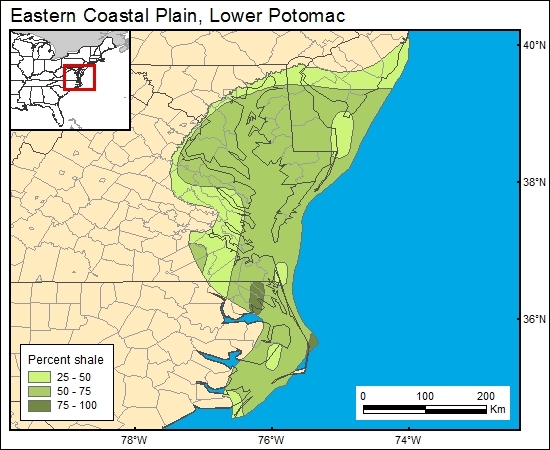 Otton and Mandle (1984) and Hansen (1984) provided information regarding distribution of shale within the Potomac Group, but their maps cover only a portion of the area of interest. Brown and others (1972) provided a percent-shale map of the lower Potomac stratigraphic interval that covers the entire area of interest, and this map is used for the GIS.